Perfect for taller users, this axe maximizes efficiency for more one-strike splits. 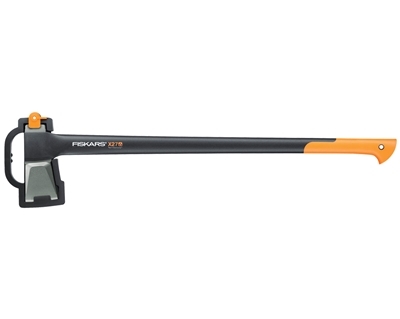 Ideal for taller users or anyone who prefers a longer axe, our much-requested X27 Splitting Axe provides power that makes splitting medium-sized to extra-large logs easier than ever. Like every X-Series™ Hatchet or Axe, the X27 combines perfected weight distribution, advanced blade geometry, an ultra-sharp edge and virtually unbreakable design to maximize your performance. This combination of features allows the blade to disperse wood more effectively, offering more one-strike splits with each swing. It also includes our longest handle for increased leverage to maximize the power and speed of taller users. Since you can split wood more easily with the X27, each job requires less time, less effort and less hand strain. For product safety warnings for this product, please click here.